Welcome to St. James Catholic School! Thank you for taking a moment to learn more about our great school. St. James has been a San Francisco school for a hundred years. St. James has been a good neighbor and companion to generations of San Franciscans. From inception, our pillars of Study, Prayer, Community and Service have guided us in our work. We are grateful to and honor our ongoing relationship with the Dominican Sisters of San Jose. St. James School serves children of families of diverse cultural ethnic, a nd socio-economi c backgrounds with all services afforded by the Archdiocese of San Francisco. Empowered by Jesus and His teachings, we accept the responsibility to help develop the gifts and talents of students, parents, and staff alike. Take a look around our website. We think you'll discover why St. James is a special place. ì La noche in Havana! Save the Date! 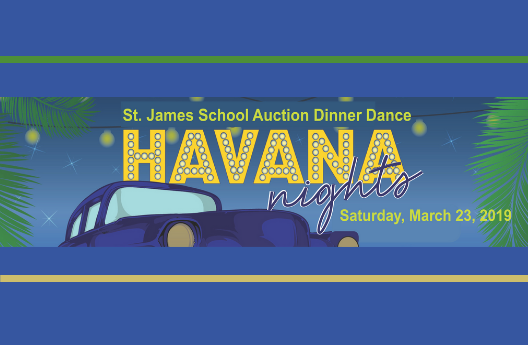 St. James Auction Dinner Dance, March 23, 2019.